This week, the twinnies have been playing outside for a while each morning, during the time #5 is at Kindergarten. This is HUGE because Logan had been fevering/seizuring every time he was out of the house for longer than 30 minutes. We eased into it last week and over the weekend,starting at ten minutes and increasing the time by five minutes each day, after I completely destroyed fatally damaged had a little mishap with the car, which made it impossible for me to drive Logan to hear sounds of rushing water to calm his meltdowns and repetitive behaviors. I had to think of something to entertain and calm Logan, fast! So, we "discovered" the back yard, where we have a large trampoline at ground level, a hill, bikes, and all kinds of insteresting stuff for the twinnies to get into.It was love at first sight. Yesterday morning, the weather was so gorgeous, and the twinnies were having such a good time, we stayed out for over an hour. I was mindful of the fact that these toddlers had never been outside for any extended period of time before last thursday, and the fact that they are blond and red head with VERY fair skin. I watched obsessively to make sure they were not getting sunburnt. At the first hint of any amount of pinkness, I had them back in the house. At this point I should mention, I have never had a toddler with a sunburn like this. I'm pushing fluids, using Aloe with vitamin E and lidocaine, and giving tylenol.. The guilt is of the all encompassing variety. Every time a car drives by, I'm hoping it isn't child services. Poor little #6. Logan, on the other hand.. cute little red headed Logan? Not even a tinge of pink. My oldest son is mixed so i never had to worry about him and the sun. My other two boys are blonde haired, blue eyed, & white as snow! I'm a hot mess when it comes to them and sun screen! 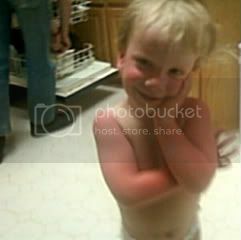 I took my middle one to Hawaii when he was 1 and I was obsessive about the sun screen! I know how you feel mama! We went to our local farmers market/swap meet and I also was paranoid about Patty and her getting burnt. Lucky she didn't.. I doubt CPS will take the kids over a sunburn LOL..
And how about you? Are you sunburned? The sun probably knew better than to mess w/Logan. 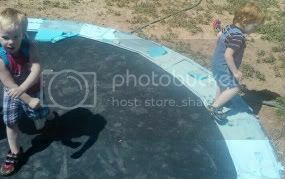 ;) I am jealous of your trampoline!